Stunning map of an legendary Persian Gulf trade port. Ormus oude Jerun. ⁄ 't Eiland Ormus, of Jerun. This is Schley's magnificent map of the island city of Hormuz. This strategically important Strait of Hormuz guards the entrance to the Persian Gulf. For centuries Hormuz had been an important stopping point in the shipping lanes from India to Arabia. In the course of its long history, Hormuz was, at various times, an independent state, part of the Arabia, part of Persia and subject to Portugal. Today it is part of Iran. Ormus is mentioned frequently in literature for its legendary wealth and beauty. It is named in the works of Milton, Coleridge, Mandeville, and Ibn Batutta, to name but a few. Our map shows the island and the nearby Persian coast. Offers stunning detail of the city of Jerun, including orchards, the Palace of the King, the church of St. Lucia, various streets, and the great Fortress. No less than 16 sailing ships ply the waters. Surrounded by a stupendous decorative border with an architectural motif. Engraved by Schley under the supervision of J. Bellin for issue as plate no. 31 in the c. 1750 edition of Provost's L`Histoire Generale des Voyages. 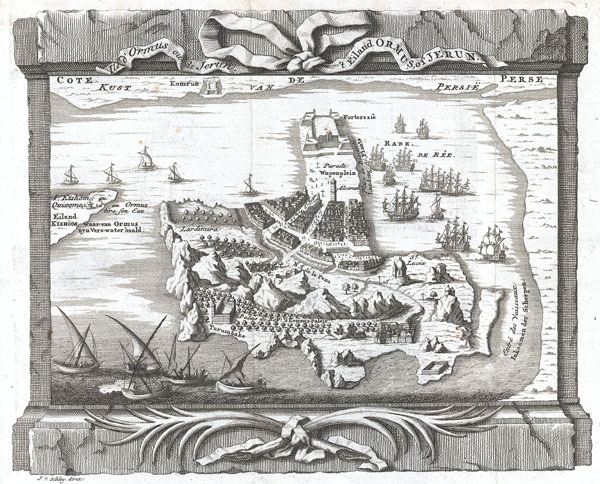 Provost, A., L`Histoire Generale des Voyages, c. 1750. Very good condition. Some marginal toning outside printed area. Dunn, Ross E., The Adventures of Ibn Battuta: A Muslim Traveler of the 14th Century, Croom Helm, London & Sydney, 1986, p. 131 and p. 136 n. 41 p. 268 and p. 288 n. 3.